Yangon International Airport (YIA) has awarded its six millionth passenger of the year, a family of three, with K1 million in cash and other valuable gifts, on December 28. China’s Huawei telecommunications company and Myanmar’s Rectors’ committee signed a Memorandum of Understanding (MoU) on Saturday for ICT talent development under the management of the Education Ministry. The closure of a border crossing to China by the Myanmar Army in northern Shan state has stranded more than 1,000 trucks transporting fruit, causing heavy financial losses for Myanmar farmers and businesspeople who make their living exporting produce and seafood to Chinese consumers, RFA reported. A spokesman for the Union Solidarity and Development Party (USDP) said the civilian government’s plans to place the General Administration Department (GAD) under its control could leave key government operations worse off. Myanmar only exported over 1.5 million tons of rice and broken rice within eight months from April 1 till December 14, according to Myanmar Rice Federation (MRF). Yangon region investment committee allowed over US$37 million and Ks3.493 billion worth of investments which can create more than 2,500 job opportunities in the region, according to the committee. China’s tin ore and concentrates imports totalled 17,884 mt in November, of which 17,398 mt originated from Myanmar, according Shanghai Metals Market. The Ministry of Planning and Finance is preparing to launch an interactive and publicly accessible online “project bank” containing priority initiatives that have been screened and approved by the government for their positive impact on economic and social development. Myanmar’s army accused rebels on Friday of attacking and killing “some” of its soldiers, the first skirmish acknowledged by the military in the wake of its unprecedented ceasefire with ethnic armed groups. Two murderers of an editor from the Iron Rose Journal in Pazundaung Township, Yangon Region, have been sentenced to 20 years each in prison and the wife of one convict to six years in prison plus labour, according to East District Court. Coal extraction company gets the green light to operate in Shan State next year despite polluting the air, land and water for nearly two decades. Myanmar Metals Limited (MYLO.AX) are in focus today as the charts are revealing that the Mesa Adaptive Moving Average (MAMA) has trickled below the FAMA, or Fractional Moving Average. Yoma Land Co, a realty brand under the Singapore-listed Yoma Strategic Holdings Ltd and Yangon-listed First Myanmar Investment Co (FMI), recently announced its plans for public sales of affordable residential units in its City Loft development. Transport Minister U Thant Sin Maung admitted to the Amyotha Hluttaw (Upper House) last week that the public rail system is losing money because of declining ridership and underscored the need to make rail transportation more competitive. The decision by the Tatmadaw (military) to unilaterally declare a four-month ceasefire in a limited area has created a new chance to move forward the government-initiated peace process. 2018 is the year in which Myanmar’s failure to execute key reforms has plunged the country into crises and chaos, overshadowing the considerable progress made in some areas. It would take years, if not decades, before we climb out of the abyss into which we have sunk. The Myanmar economy moved forward in 2018, during which it opened up several industries to foreign investors and raised efforts to upgrade and organise the avenues through which funds are channelled into needed areas of the economy. Efforts to expunge hate speech from social media platforms in Myanmar are hampered by the volume of traffic, multiple languages and a shortage of moderators and fact checkers. Farmers meet with government officials to hammer out issues over land tenure. In the first meeting of its kind, farmers from southern Shan State discussed land grievances with government officials in Taunggyi; the capital of Shan State. Nay Pyi Taw may be the administrative capital of the country, and Yangon the economic centre, but Mandalay remains one of Myanmar’s preeminent cities. 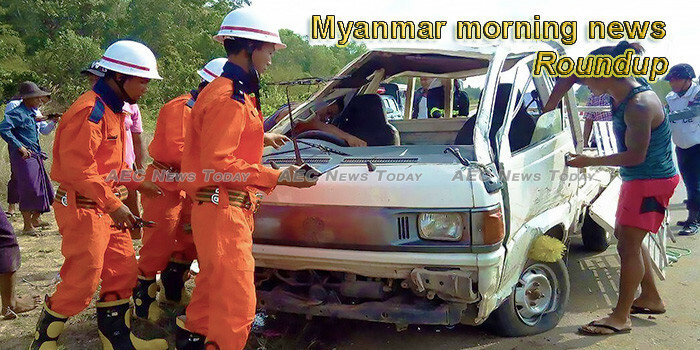 Since Myanmar eased its auto import policy, allowing individual auto imports in 2013, the number of vehicles in the country has surged by three million, according U Thar Oo, Deputy Minister of the Ministry of Transportation and Telecommunications. Fighting has escalated recently between two rival Shan ethnic armed groups in northern Shan State. At the same time, the Myanmar military, or Tatmadaw, has announced a halt to its military operations across much of the country, including Shan State. The Irrawaddy interviewed the vice chairman of the Shan State Progress Party/Shan State Army-North (SSPP/SSA-N), Major General Khun Hseng, about these developments. Ko Htoo Myint Naung clearly remembered his days as a student at the Computer University. At about 6:30 in the morning, he and other students would be joking with each other: “Here comes 41-years-old, here come 42-years-old”, as their school bus, which usually served as a funeral coach later in the day, would have the name of the dead person and his/her age attached to the vehicle. In a joint operation between Myanmar military troops and border police, approximately 100 members carried out thorough household checks across Yae Gaung Chaung Village in northern Rakhine State’s strife-torn Rathedaung Township, forcing the entire population of the village to move to a Buddhist monastery on Thursday following days of clashes between the Arakan Army (AA) and Tatmadaw (Myanmar Army) troops. For 30 years, the military-controlled General Administration Department has been the backbone of Myanmar’s public administration. Myanmar has made significant progress compared to its Asian neighbours in preventing diseases associated with the use of illegal drugs, an international non-governmental organisation said. A newly released report by Rainmaker, also known as Myanmar Observation Network, on the 2018 by-elections in Myanmar shows women’s political participation is on the wane. Though Rohingyas the ethnic Muslim community have been living in Rakhine State of Myanmar for time-immemorial, efforts to deprive Rohingya from citizenship began shortly after Myanmar’s independence. Villagers in conflict areas of western Myanmar’s Rakhine state said Thursday that government army soldiers are detaining civilians they accuse of supporting Rakhine rebels amid fighting between the Arakan Army and Myanmar troops. The killing of ethnic Pa’O civilians by Shan soldiers spurs a community to seek justice. The Tatmadaw (government defence services) has issued a statement calling on news media to only report on battle news in fighting with ethnic armed organizations (EAOs) after verifying the clashes with the Tatmadaw. The Myanmar Press Council on Friday called on the nation’s often secretive military to explain a recent clash with an ethnic armed group in war-torn Shan state, following accusations that several media outlets had published false reports about Christmas Day fighting in Kutkai township. Myanmar will soon hold an international automobile exhibition in Yangon in January next year, the official Global New Light of Myanmar reported on Wednesday. Welcome to Dateline Irrawaddy! We are now bidding farewell to 2018 and welcoming 2019.